The global algae market is predicted in a report by Transparency Market Research (TMR) to bear a largely consolidated vendor landscape with three key players securing a colossal aggregate share. Sapphire Energy Inc., Algenol, and Solazyme Inc. are the three companies that have showcased their prominence in the market. In order to cement their place in the market, players are expected to put high emphasis on building strong distribution channels. Other players such as Pond Biofuels Incorporated and Algae.Tec are looking to make their presence known in the market. TMR foresees the global algae market to expand at a 7.39% CAGR during the forecast tenure 2016-2024 to earn around US$1.1 bn by the end of 2024. By cultivation technology, open pond cultivation could continue to generate higher demand in the market. By region, North America is anticipated to take the lead in the market. In 2016, the U.S. accounted for an 87.6% share of the regional market by value. As pointed out by a TMR analyst, there has been a tremendous rise of the world algae market in the recent years. Of late, the need to shift from fossil fuel resources to renewable energy sources has become prominent. This could be due to the worrying increase in carbon emission from scores of industries. As a result, demand for algae biomass is projected to increase at a telling rate since it is an important ingredient used to produce biofuel. 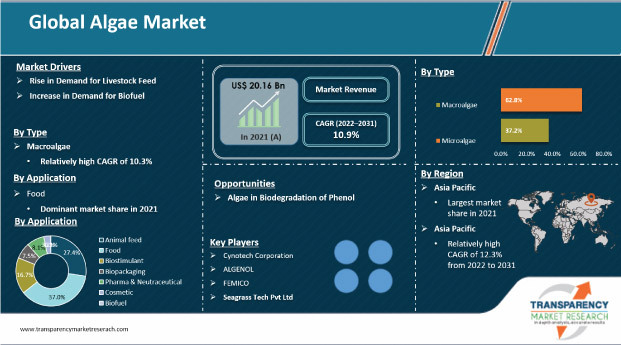 Vendors operating in the world algae market could expect lucrative growth opportunities birthing on the back of high focus on the use of renewable energy sources in both developing and developed countries. Furthermore, increasing demand for biofuel because of the implementation of tight emission standards and policies is forecasted to set the tone for valuable growth in the market. In the foreseeable future, growth of the international algae market is foretold to slow down due to the negative impact of reduction in crude oil prices. Another factor that could deter market growth is expensive capital investment required for research and development to develop advanced algae production techniques. However, the international algae market is envisaged to gather pace in terms of growth as rising application of algae in wastewater treatment creates a wealth of opportunities in the near future. Furthermore, constant increase in industrial activities is prognosticated to augment the demand in the market. Use of algal biotechnology in carbon dioxide capture and utilization could act as another opportunity for market growth. Increasing efforts to commercialize biofuel production from algae could help raise more demand in the market.